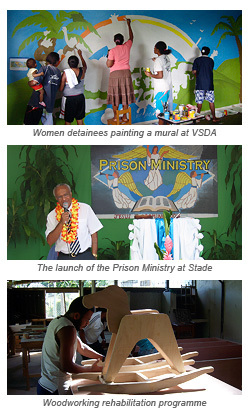 The Vanuatu Department of Correctional Services provides a range of programmes and training for detainees within the Correctional Centres and for offenders in the community. The "Nuifala Rod" (New Road) programme involves helping offenders to understand the reasons for their offending and assists them to make positive plans for living a good life in the community. In the Correctional Centres there are a wide range of activities. These include learning vocational skills such as joinery and construction, art and woodwork. The motto of Vanuatu is "Long God Yumi Stanap" (We stand with God) so church activities are an established part of the Correctional Centres. Along with church activities, kastom guidance and knowledge from chiefs is a key part of guiding detainees and offenders to live good lives and respect the kastom values of Vanuatu.